Holiday Inn Preston is a modern city centre hotel, centrally located for great access to the local areas of trade & commerce, shops, restaurants, attractions and nightlife. The hotel has 133 fully air-conditioned bedrooms, including a full executive floor, offering superior comfort and a great nights sleep. We are ideally siuated a little over 2 miles from Preston Golf Club. The hotel proudly boasts its position as being the flagship hotel in Preston City Centre. With a full service Restaurant, Bar, Lounge and 24-hour room service, we can certainly cater for all of your requirements. New tempting Seasonal Menus in place. For our leisure guests, or those visiting friends & family, the Holiday Inn Preston is a short distance from the Charter Theatre, Guild Hall and Preston North End F.C, with the National Football Museum. Even with its central location, the hotel is a fantastic base to enjoy the Lancashire Countryside. Our strong motorway links provide short journeys to the Ribble Valley, Lake District and Yorkshire Dales. Blackpool, Lytham St Annes and Southport are all within easy reach. Preston train station is less than a mile from the hotel. 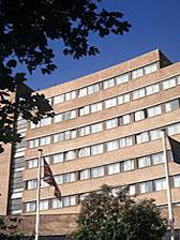 In 2005, the hotel received £2m investment including the provision of a brand new Meeting & Training centre with wi-fi internet access, Executive Boardroom and Mini-Gym. High speed internet access is available in all of our bedrooms.